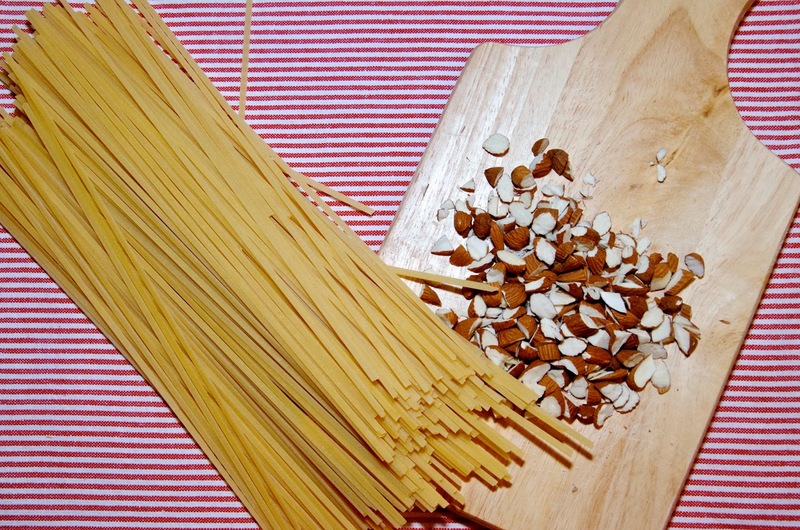 Pasta with almonds is a revelation. I suppose it's not really because pine nuts and pistachios are so frequently used in Italian pasta dishes, but almonds with chicken and linguine in a creamy sauce is fairly new to me and just what I want on evenings when I need something comforting, delicious and fast. 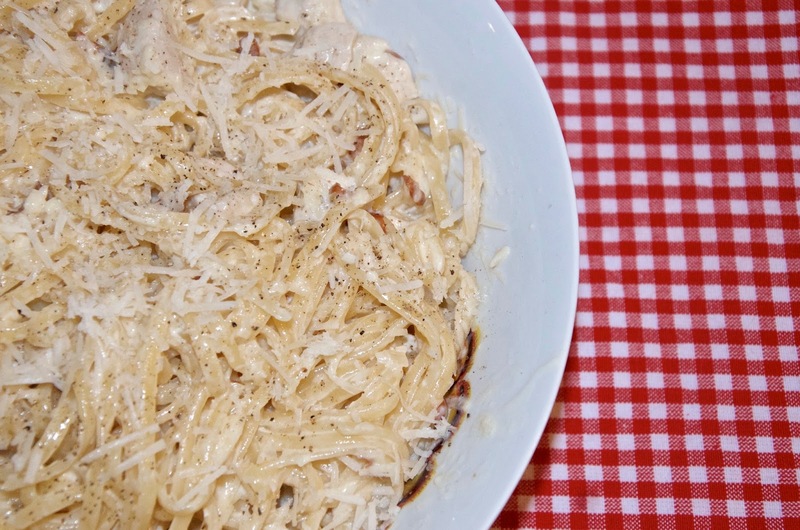 The creamy sauce, the saltiness of the parmesan cheese, the succulent chicken, the crunchy almonds and the pasta with just the right amount of bite make this a winning weeknight supper, although sometimes I like to make this on a Sunday afternoon to devour while putting my feet up and enjoying a good book or movie. This recipe doesn't take much time to put together and it's pretty simple in terms of ingredients... Most of the things you use here will probably already be in your fridge or cupboards and if not, they're easily found almost anywhere. If you've never chopped almonds before, don't let this intimidate you. There's not a super large quantity of nuts in this recipe, so the chopping only takes a few minutes. I find it's easiest to use my sharpest knife and chop slowly and intentionally so the pieces don't go flying. If you like, you can of course chop each nut individually... Either way, it doesn't take long and it's easier than it looks once you get the hang of it. Also, it may seem like a good idea to use blanched almonds, but there's no need... Use the almonds with their skin still on, but make sure they are plain and not salted at all or this will effect the taste of your dish. 1. Cook the pasta according to packet instructions in a large pot of salted boiling water with a drop of oil, checking on it about 2 minutes before it's supposed to be done. Reserve 1 cup of the starchy pasta cooking water, strain and keep warm until it's time to serve. 2. Meanwhile, start the sauce by melting the butter in a frying pan over mdeium heat. When the butter is melted and hot, reduce the heat to medium-low and cook the shallots, stirring ocassionally until they are soft and starting to look a bit translucent. 3. Add the diced chicken pieces, increase the heat to medium-high and cook the chicken, stirring ocassionally for about 7 minutes or until cooked through. 4. Increase the heat to high and pour in the white wine. Cook for another 2 minutes or so, letting the mixture bubble away and reduce slightly. 5. Add the almonds and stir in the double cream. Reduce the heat to low and simmer for 10 minutes, stirring ocassionally. 6. Season the sauce with salt & pepper to taste. 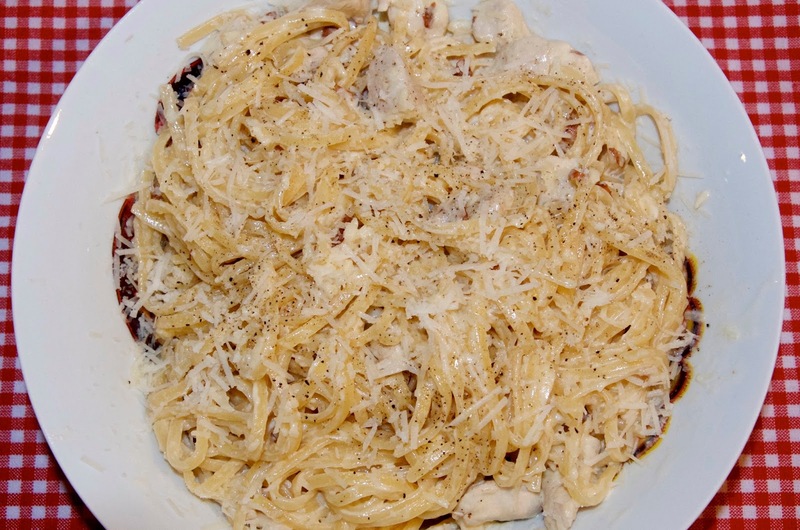 Tip the pasta into a warm serving bowl and then pour the sauce over the strained linguine. Toss to coat, making sure that each strand of pasta is coated with the creamy sauce. If it's a bit dry, add some of the cooking water, 1 teaspoon at a time, tossing after each addition until you have the consistency you're after. 7. 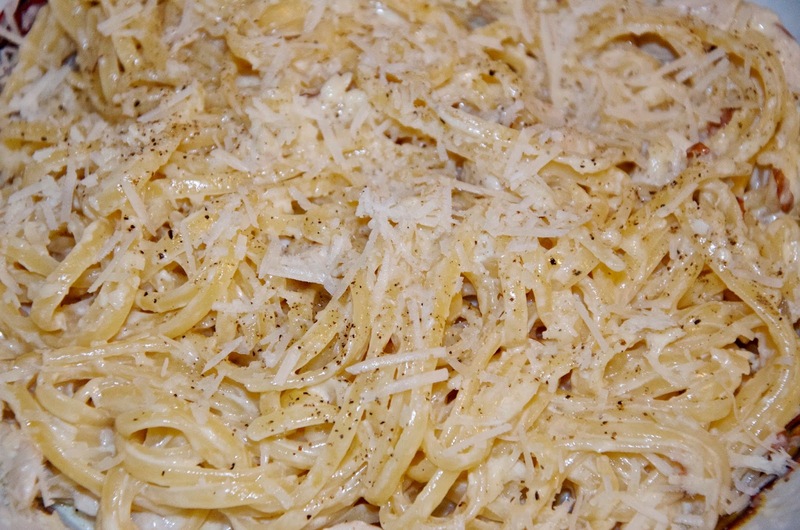 Sprinkle the pasta with the parmesan cheese and a few generous grinds of fresh black pepper. Serve immediately.